Left: Schematic diagram of the proposed fiber; Right: spectrum profiles of pump pulses at propagation distances of 0, 5 and 100 cm from the top to the bottom, respectively. The pump pulses are 200-fs duration and 100-kW peak power at 1550 nm. Comprising various dispersive and nonlinear effects, supercontinuum (SC) generation in fibers is a very active field of research that provides a high-brightness broadband optical source for a wide set of applications, such as ultrashort pulse generation and optical frequency metrology. The high flatness and high coherence properties of SC are essential for some applications. In general, SC generation in fibers has been extensively explored using pump pulses in the anomalous dispersion regime. Soliton splitting and modulation instability can lead to bad coherence and fine structures in spectra. SC generation in all-normal dispersion fibers is mainly dependent on self-phase modulation (SPM) and optical wave-breaking (OWB). Both the effects can maintain smooth phase distribution as well as the integrity of the pump pulses in the time domain. However, it is a challenge to generate ultraflat SC spectra with broad pump pulses. A research team from Shanghai Institute of Optics and Fine Mechanics, CAS propose an all-solid microstructured fiber composed only of hexagonal glass elements. The optimized fiber possesses a low and flat all-normal dispersion profile, covering a wide wavelength interval of approximately 1.55 μm. An SC spectrum spanning from approximately 1030 to 2030 nm (corresponding to nearly one octave) with flatness < 3 dB is numerically generated in the fiber pumped by 200-fs pulses with 100 kW peak power at 1.55 μm. Moreover, the SC pulses feature high coherence and a single pulse in the time domain, which can be compressed to 13.9-fs pulses with high quality even for simple linear chirp compensation. 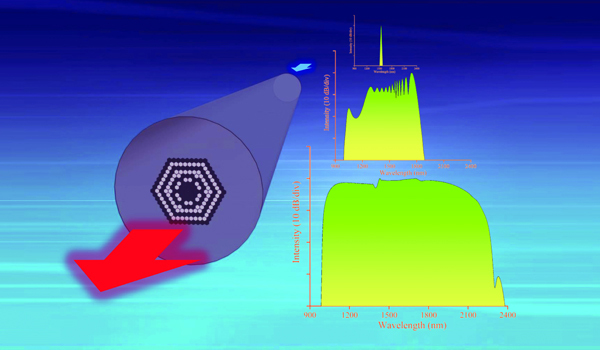 Related results are published in Photonics Research, Volume 6, No. 6, 2018 (C. Huang et al. Ultraflat, broadband, and highly coherent supercontinuum generation in all-solid microstructured optical fibers with all-normal dispersion). Compared with results of previous papers, the fiber allows much longer pump pulse duration to generate ultraflat, broadband, and highly coherent supercontinuum. Researchers from this team believe that this study is of great importance due to the width at −3 dB of the maximum spectral intensity almost corresponding to the full width at half-maximum spectral intensity, and the fiber as the nonlinear media can potentially be used in all-fiber, ultraflat and highly coherent SC systems. The further work will focus on the realization of all-fiber SC sources and ultrashort pulse generation.